‘Project based learning’ is a method supporting constructivism to inspire students to ‘think, connect, create and share’. Project learning makes an attempt to connect knowledge and skills with personal experience in collaborative manner resulting in life skill learning. Project learning bridges the gap between learning core knowledge and applied skills - the gap between ‘knowing’ and ‘doing’. This offers the students to become critical thinkers, problem solvers, and effective communicators. Effective project learning is open-ended and deals with curriculum based problems, issues, and challenges. The learning paths are unpredictable, but the result is often a more in-depth of understanding of the content leading to 21st century thinking and learning. Students experience and explore relevant, real-world problems, questions, issues or challenges. Students learn to live in 21st century by relating subject content to life. Students present what they have learnt and share. The teacher does not direct or manage all student work. The teacher is a facilitator, guide, mentor, and advisor. Learning for School and Learning for Life. Essential questions: Teacher has to create an authentic, engaging, open-ended question that poses a problem or situation that has meaning and relevance for students. Project design: Teacher has to identify standards based activities that support the essential question and involve the students in the project design, causing them to develop a sense of project ownership. Work plan: The teacher prepares tasks, subtasks, milestones, timeline etc. for completing each component, and other activities related to the project. 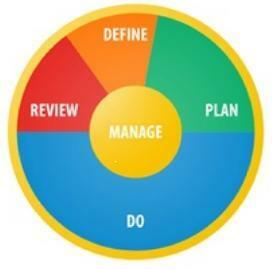 Project Management: The teacher guides the students in working in collaboration. Oversees students’ activity and provides structure and feedback. Culminating products: In the form of presentation, exhibition etc. Assessment: PBL requires variety of assessments tied to the content standards, skills and higher order thinking skills, attitude and application level. Teacher has to use multiple indicators of performance to give students with different strengths and opportunities to make a successful project. The 'Define' phase includes Project topics, outcomes, scope, and links to curricula, strategies and assessment approaches. The overview of the Define phase in the project learning cycle includes a number of approaches and techniques. “Begin with the end in mind” is helpful to expand the techniques into something more practical. A balanced assessment approach is very useful to make students to work confidently. In 'Plan' phase the project is broken down in manageable pieces. Project roles are assigned and a timeline is planned for the project. The information on building a work plan is very useful which will help the students to work on the right direction with proper time management. Breaking the projects into sub topics is to make the task easier. Use of resources will make students collect information without wasting time. The learning project is launched and conducted with students. The products resulting from students' work are collected for assessment. It ends with a celebration of the successful completion of the project. In 'Review' phase, teachers and students reflect on the outcome/products of the recently completed learning project. Reflection and evaluation are critical in assessing the success of the project and the improvements that can be made in future. It includes assessment and grading. It is central to all other phases. Most activities in this phase span the duration of the project. It includes process management, preparation prior to launch, facilitation, progress monitoring, re-planning, conflict management, and monitoring milestones and checkpoints. Based on the above mentioned 5 phases ‘Project plan’ and ‘Work plan’ are prepared. It includes Survey, Surfing, and Interaction through message boards, Guest lectures, and group work with peers and presentation. PBL requires that teacher to move from the front of the classroom to the center of students’ discussion, where they effectively act as a learning guide and facilitator. Teacher participates as a mentor. Arranges field trips, guest lectures and provides infrastructure. Supervises students’ activity and provides structure, guidance and feedback. Supports and encourages students’ thinking as they work on project, and challenges them to go beyond textbook. Avoids making decision for students. Highlights the problems to solve instead of solving it. Deeper knowledge of subject matter. Improved research and problem-solving skills. Understanding how academics connect to jobs and careers. Selected ten schools withPrincipal/ VP as coordinator. Regional level blog is created. In ‘Project Based Learning’, the child works in a multi-cultural world, thinks critically, and communicates well with the teacher adopting the role of a mentor and a facilitator. The students acquire 21st Century learning skills, Critical thinking, Creativity, Team work, Cross-cultural understanding, Communication, Technology and Self-direction. “Tell me and I forget; Teach me and I remember; Involve me and I learn”.